New Research Issued on Laep Investments Ltd.
Today we issued an updated, 44-page Executive Informational Overview® (EIO®) on Laep Investments Ltd. Laep’s Brazilian depositary receipts (BDRs) are traded on the São Paulo Stock Exchange (Bovespa) under the ticker “MILK11.” As well, the Company is listed on the Euro MTF market of the Luxembourg Stock Exchange. 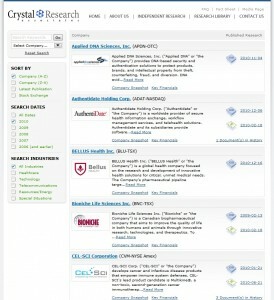 This morning, we at Crystal Research debuted a new Research Library webpage. The new page is designed to be easier to navigate and encompasses several new search tools. In addition to viewing an A to Z listing of companies under our coverage, readers can now sort by date, industry, and exchange. We have also created dedicated pages for each company listed in our portfolio. These pages present a brief overview of each firm and include all research that we have published on that firm, as well as recent press releases, stock charts, and key financials (via feeds from Yahoo! Finance).